Kia Motors India (KMI), who brought the Australian Open (AO) Ballkids International Program to India last month, conducted the final selection round for the program in Delhi today, at the RK Khanna Tennis Stadium. After bringing the FIFA OMBC (Official Match Ball Carrier) program to India, KMI is now on the cusp of concluding its second sports initiative in the country, the AO Ballkids International Program in Delhi. The company opened up entries for the Ballkids Program starting last month to identify the official Kia Ballkids for the Australian Open. 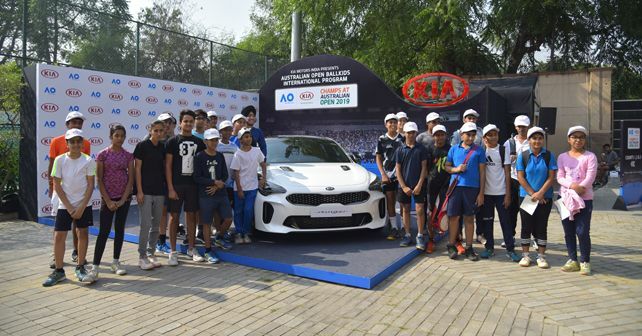 By bringing the Ballkids Program to India, Kia Motors celebrates its long-term association with the game of tennis (as Kia has been a major sponsor of the Australian Open since 2002) and also highlights KMI's official arrival in India. As a part of this initiative, KMI has joined hands with Indian tennis legend Mahesh Bhupathi for the selection and training process. After receiving digital registrations from over 1,800 applicants, KMI began with its regional selection rounds in the metropolitan cities of Mumbai, Bengaluru and Kolkata and shortlisted 100 applicants (kids aged between 12-15 years). Now, for its fourth and final selection round, the program has reached Delhi where officials from Australian Open, along with Mahesh Bhupathi, will select the final 10 Kia Ballkids for the 2019 Australian Open. This will also be the largest Ballkids squad to be sent from India. Interestingly, tennis greats such as John McEnroe and Roger Federer have both served as ball boys during their childhood days before going on to become legends of the game itself. Thus, as stated by Mahesh Bhupathi, it is indeed a once-in-a-lifetime opportunity for the chosen ones to experience the game and their favourite stars live and gain inspiration.